Finch Chrysler odge Jeep Ram Ltd. When London resident go looking for a new vehicle, they want one that not only provides a smooth ride but also looks amazing from the outside. It is for this reason that the Finch Chrysler Dodge Jeep Ram team often suggests that our customers strongly consider purchasing the new Chrysler Pacifica. This popular family minivan turns heads everywhere it goes. Perhaps the most exciting exterior feature of the new Pacifica is the sheer number of different paint color options that are available. You will have a total of ten to choose from, including Jazz Blue Pearl, Velvet Red Pearl, and Maximum Steel Metallic. No matter what your preferences may be, the Pacifica has the perfect color for you. Of course, the exterior features don't end there. 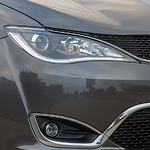 The new Chrysler Pacifica also offers available LED signature Daytime Running Lamps. These features help to light the road ahead and accentuate the look of this fantastically stylish vehicle.